Mycenaean Greece (or the Mycenaean civilization) was the last phase of the Bronze Age in Ancient Greece, spanning the period from approximately 1600–1100 BC. It represents the first advanced civilization in mainland Greece, with its palatial states, urban organization, works of art, and writing system. The most prominent site was Mycenae, in the Argolid, after which the culture of this era is named. Other centers of power that emerged included Pylos, Tiryns, Midea in the Peloponnese, Orchomenos, Thebes, Athens in Central Greece and Iolcos in Thessaly. Mycenaean and Mycenaean-influenced settlements also appeared in Epirus, Macedonia, on islands in the Aegean Sea, on the coast of Asia Minor, the Levant, Cyprus and Italy. The Mycenaean Greeks introduced several innovations in the fields of engineering, architecture and military infrastructure, while trade over vast areas of the Mediterranean was essential for the Mycenaean economy. Their syllabic script, the Linear B, offers the first written records of the Greek language and their religion already included several deities that can also be found in the Olympic Pantheon. Mycenaean Greece was dominated by a warrior elite society and consisted of a network of palace-centered states that developed rigid hierarchical, political, social and economic systems. At the head of this society was the king, known as wanax. The Bronze Age in mainland Greece is generally termed as the "Helladic period" by modern archaeologists, after Hellas, the Greek name for Greece. This period is divided into three subperiods: The Early Helladic (EH) period (c. 2900–2000 BC) was a time of prosperity with the use of metals and a growth in technology, economy and social organization. The Middle Helladic (MH) period (c. 2000–1650 BC) faced a slower pace of development, as well as the evolution of megaron-type dwellings and cist grave burials. Finally, the Late Helladic (LH) period (c. 1650–1050 BC) roughly coincides with Mycenaean Greece. 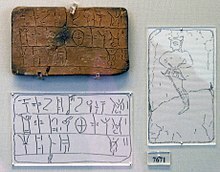 The decipherment of the Mycenaean Linear B script, a writing system adapted for the use of the Greek language of the Late Bronze Age, demonstrated the continuity of Greek speech from the second millennium BC into the eighth century BC when a new script emerged. 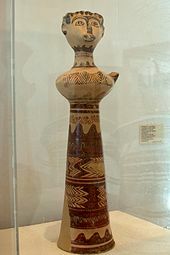 Moreover, it revealed that the bearers of Mycenaean culture were ethnically connected with the populations that resided in the Greek peninsula after the end of this cultural period. Various collective terms for the inhabitants of Mycenaean Greece were used by Homer in his 8th century BC epic, the Iliad, in reference to the Trojan War. The latter was supposed to have happened in the late 13th – early 12th century BC, when a coalition of small Greek states under the king of Mycenae, besieged the walled city of Troy. Homer used the ethnonyms Achaeans, Danaans and Argives, to refer to the besiegers. These names appear to have passed down from the time they were in use to the time when Homer applied them as collective terms in his Iliad. There is an isolated reference to a-ka-wi-ja-de in the Linear B records in Knossos, Crete dated to c. 1400 BC, which most probably refers to a Mycenaean (Achaean) state on the Greek mainland. Egyptian records mention a T(D)-n-j or Danaya (Tanaju) land for the first time c. 1437 BC, during the reign of Pharaoh Thutmoses III (r. 1479–1425 BC). This land is geographically defined in an inscription from the reign of Amenhotep III (r. circa 1390–1352 BC), where a number of Danaya cities are mentioned, which cover the largest part of southern mainland Greece. Among them, cities such as Mycenae, Nauplion and Thebes have been identified with certainty. Danaya has been equated with the ethnonym Danaoi (Greek: Δαναοί), the name of the mythical dynasty that ruled in the region of Argos, also used as an ethnonym for the Greek people by Homer. During this period, the Mycenaean centers witnessed increased contacts with the outside world and especially with the Cyclades and the Minoan centers in the island of Crete. 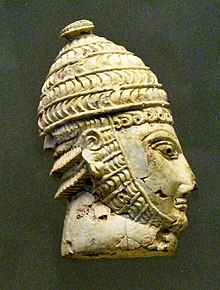 Mycenaean presence appears to be also depicted in a fresco at Akrotiri, on Thera island, which possibly displays many warriors in boar's tusk helmets, a feature typical of Mycenaean warfare. 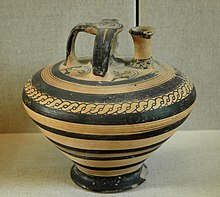 In the early 15th century BC, commerce intensified with Mycenaean pottery reaching the western coast of Asia Minor, including Miletus and Troy, Cyprus, Lebanon, Palestine and Egypt. None of the defence measures appear to have prevented the final destruction and collapse of the Mycenaean states. A second destruction struck Mycenae in c. 1190 BC or shortly thereafter. This event marked the end of Mycenae as a major power. The site was then reoccupied, but on a smaller scale. The palace of Pylos, in the southwestern Peloponnese, was destroyed in c. 1180 BC. The Linear B archives found there, preserved by the heat of the fire that destroyed the palace, mention hasty defence preparations due to an imminent attack without giving any detail about the attacking force. 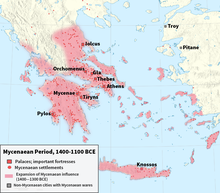 Alternative scenarios propose that the fall of Mycenaean Greece was a result of internal disturbances which led to internecine warfare among the Mycenaean states or civil unrest in a number of states, as a result of the strict hierarchical social system and the ideology of the wanax. In general, due to the obscure archaeological picture in 12th-11th century BC Greece, there is a continuing controversy among scholars over whether the impoverished societies that succeeded the Mycenaean palatial states were newcomers or populations that already resided in Mycenaean Greece. Recent archaeological findings tend to favor the latter scenario. Additional theories, concerning natural factors, such as climate change, droughts or earthquakes have also been proposed. Another theory considers the decline of the Mycenaean civilization as a manifestation of a common pattern for the decline of many ancient civilizations: the Minoan, the Harrapan and the Western Roman Empire; the reason for the decline is migration due to overpopulation. The period following the end of Mycenaean Greece, c. 1100–800 BC, is generally termed the "Greek Dark Ages". The palatial structures of mainland Greece share a number of common features. The focal point of the socio-political aspect of a Mycenaean palace was the megaron, the throne room. It was laid out around a circular hearth surrounded by four columns. The throne was generally found on the right-hand side upon entering the room, while the interior of the megaron was lavishly decorated, flaunting images designed intentionally to demonstrate the political and religious power of the ruler. Access to the megaron was provided through a court, which was reached from a propylon. The iconography of the palatial chambers is remarkably uniform throughout Greece. For instance, in Pylos and Tiryns the paintings are focused on marine motifs, providing depictions of octopodes, fish and dolphins. Around the megaron a group of courtyards each opened upon several rooms of different dimensions, such as storerooms and workshops, as well as reception halls and living quarters. In general Mycenaean palaces have yielded a wealth of artifacts and fragmentary frescoes. The Mycenaean period has not yielded sculpture of any great size. The statuary of the period consists for the most part of small terracotta figurines found at almost every Mycenaean site in mainland Greece—in tombs, in settlement debris, and occasionally in cult contexts (Tiryns, Agios Konstantinos on Methana). The majority of these figurines are female and anthropomorphic or zoomorphic. The female figurines can be subdivided into three groups which were popular at different periods, as Psi and phi type figurines, the Tau-type. The earliest are the Phi-type, which look like the Greek letter phi and their arms give the upper body of the figurine a rounded shape. The Psi-type looks like the letter Greek psi: these have outstretched upraised arms. The latest (12th century BC) are the Tau-type: these figurines look like the Greek letter tau with folded(?) arms at right angles to the body. Most figurines wear a large 'polos' hat. They are painted with stripes or zigzags in the same manner as the contemporary pottery and presumably made by the same potters. Their purpose is uncertain, but they may have served as both votive objects and toys: some are found in children's graves but the vast majority of fragments are from domestic rubbish deposits. The presence of many of these figurines on sites where worship took place in the Archaic and Classical periods (approximately 200 below the sanctuary of Athena at Delphi, others at the temple of Aphaea on Aegina, at the sanctuary of Apollo Maleatas above Epidauros and at Amyklae near Sparta), suggests both that many were indeed religious in nature, perhaps as votives, but also that later places of worship may well have first been used in the Mycenaean period. Beginning also in the Late Helladic period are to be seen communal tombs of rectangular form. Nevertheless, it is difficult to establish whether the different forms of burial represent a social hierarchization, as was formerly thought, with the "tholos" being the tombs of the elite rulers, the individual tombs those of the leisure class, and the communal tombs those of the people. Cremations increased in number over the course of the period, becoming quite numerous in the last phase of the Mycenaean era. The tholos was introduced during the early 15th century as the new and more imposing form of elite burial. The most impressive tombs of the Mycenaean era are the monumental royal tombs of Mycenae, undoubtedly intended for the royal family of the city. The most famous is the Treasury of Atreus, a tholos. 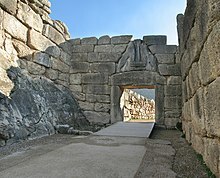 A total of nine of such tholos tombs are found in the region of Mycenae, while six of them belong to a single period (Late Helladic IIa, c. 1400–1300 BC). It has been argued that different dynasties or factions may have competed through conspicuous burial. ^ a b c d e f g Fields 2004, pp. 10–11. ^ Hammond 1976, p. 139: "Moreover, in this area a small tholos-tomb with Mycenaean pottery of III B style and a Mycenaean acropolis have been reported at Kiperi near Parga, and another Mycenaean acropolis lay above the Oracle of the Dead on the hill called Xylokastro." ^ Tandy 2001, p. xii (Fig. 1); p. 2: "The strongest evidence for Mycenaean presence in Epirus is found in the coastal zone of the lower Acheron River, which in antiquity emptied into a bay on the Ionian coast known from ancient sources as Glykys Limin (Figure 2-A)." ^ Borza 1992, p. 64: "The existence of a Late Bronze Age Mycenaean settlement in the Petra not only confirms its importance as a route from an early period, but also extends the limits of Mycenaean settlement to the Macedonian frontier." ^ van Wijngaarden 2002, Part II: The Levant, pp. 31–124; Bietak & Czerny 2007, Sigrid Deger-Jalkotzy, "Mycenaeans and Philistines in the Levant", pp. 501–629. ^ van Wijngaarden 2002, Part III: Cyprus, pp. 125–202. ^ Peruzzi 1980; van Wijngaarden 2002, Part IV: The Central Mediterranean, pp. 203–260. ^ Morris 1996, "Greece: Dark Age Greece", pp. 253–256. ^ The extent to which Homer attempted to or succeeded in recreating a "Mycenaean" setting is examined in Moses I. Finley The World of Odysseus, 1954. ^ Chadwick 1976, p. 617. ^ Latacz 2004, pp. 159, 165. ^ Latacz 2004, p. 120. ^ Latacz 2004, p. 138. ^ Hajnal & Posch 2009, pp. 1–2. ^ a b Kelder 2010, pp. 46–47. ^ Kelder 2010, pp. 37–38; Latacz 2004, p. 159. ^ a b Beckman, Bryce & Cline 2012, p. 4. ^ Latacz 2004, p. 123. ^ Bryce 2005, p. 58. ^ Latacz 2004, p. 122. ^ Bryce 2005, p. 357. 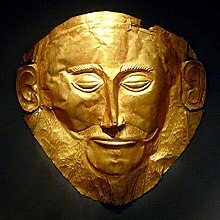 ^ Burns 2010, p. 92: "The most famous object from Shaft Grave V, if not all of Mycenaean Greece, is the gold mask popularly known as the "mask of Agamemnon"." ^ a b Dickinson 1977, pp. 32, 53, 107–108; Dickinson 1999, pp. 97–107. ^ a b c d Schofield 2006, p. 31. ^ Schofield 2006, p. 51. ^ Schofield 2006, p. 48. ^ Schofield 2006, p. 32. ^ Dickinson 1977, pp. 53, 107. ^ Schofield 2006, p. 67. ^ Schofield 2006, pp. 64–68. ^ Castleden 2005, p. 97; Schofield 2006, p. 55. ^ Chadwick 1976, p. 12. ^ Tartaron 2013, p. 28. ^ a b c Schofield 2006, pp. 71–72. ^ Schofield 2006, p. 75. ^ a b c Kelder 2010, p. 8. ^ Tartaron 2013, p. 21. ^ Kelder 2010, pp. 50, 52. ^ a b Bryce 2005, p. 361. ^ Castleden 2005, p. 194: "The Mycenaean colonies in Anatolia were emphatically confined to a narrow coastal strip in the west. There were community-colonies at Ephesus, Iasos and Miletus, but they had little effect on the interior..."
^ a b Kelder 2010, p. 107. ^ Kelder 2010, pp. 108–109. ^ Kelder 2010, p. 11; Fields 2004, p. 53. ^ a b c Beckman, Bryce & Cline 2012, p. 6. ^ Kelder 2010, pp. 119–120. ^ Bryce 2005, p. 59; Kelder 2010, p. 23. ^ Bryce 2005, pp. 129, 368. ^ Bryce 2005, p. 193. ^ Kelder 2010, p. 26. ^ Bryce 2005, p. 58; Kelder 2010, pp. 119–120. ^ Bryce 2005, p. 224. ^ a b Kelder 2010, p. 27. ^ Bryce 2005, pp. 361, 364. ^ Bryce 2005, p. 290. ^ a b Kelder 2010, p. 34. ^ a b Cline 2014, p. 130. ^ a b Castleden 2005, p. 219. ^ a b c d e f g Freeman 2014, p. 126. ^ Kelder 2010, p. 33. ^ Kelder 2010, p. 32. ^ Tartaron 2013, p. 20. ^ Cline 2014, p. 129. ^ a b Tartaron 2013, p. 18. ^ Mylonas 1966, pp. 227–228. ^ Mylonas 1966, pp. 231–232. ^ Drews 1993, p. 49. ^ a b Tartaron 2013, p. 19. ^ Alexakha 2016, pp. 164–169. ^ Freeman 2014, p. 127. ^ a b Kelder 2010, p. 9. ^ Kelder 2010, p. 97. ^ Kelder 2010, pp. 8–9. ^ Kelder 2010, pp. 45, 86, 107. ^ Kelder 2010, pp. 86–87. ^ Thomas 1995, p. 350. ^ a b c d e Chadwick 1976, Chapter 5: Social Structure and Administrative System, pp. 69–83. ^ a b Kelder 2010, p. 11. ^ Chadwick 1976, pp. 71–72. ^ δῆμος. Liddell, Henry George; Scott, Robert; An Intermediate Greek–English Lexicon at the Perseus Project. ^ Olsen 2014, p. 7. ^ a b c Cline 2012, p. 145. ^ Cline 2012, p. 242. ^ a b Budin 2009, p. 94. ^ Chadwick 1976, p. 152. ^ Olsen 2014, p. 6. ^ Budin 2009, p. 96. ^ Tartaron 2013, p. 24. ^ a b c Kelder 2010, p. 116. ^ Gilstrap, William; Day, Peter; Kaza, Konstantina; Kardamaki, Elina (9 May 2013). Pottery Production at the Late Mycenaean site of Alimos, Attica. Materials and Industries in the Mycenaean World: Current Approaches to the Study of Materials and Industries in Prehistoric Greece, University of Nottingham, 9–10 May 2013 (PDF). Nottingham, UK. pp. 13–14. ^ Kelder 2010, p. 117. ^ a b c Cline 2007, p. 200. ^ Stubbings 1951, IV: Mycenaean II Pottery in Syria and Palestine; V: Mycenaean III Pottery in Syria and Palestine. ^ Cline 2012, pp. 300, 387, 787. ^ Castleden 2005, p. 107: "Huge quantities of olive oil were produced and it must have been a major source of wealth. The simple fact that southern Greece is far more suitable climatically for olive production may explain why the Mycenaean civilization made far greater advances in the south than in the north. The oil had a variety of uses, in cooking, as a dressing, as soap, as lamp oil, and as a base for manufacturing unguents." ^ Tartaron 2013, p. 29; Kling 1989; Nikolaou 1973; International Archaeological Symposium 1973. ^ Cline 2007, p. 197. ^ Cline 2007, p. 196. ^ Boston University – The Historical Society. ^ Tartaron 2013, p. 22; Feuer 2004, pp. 155–157; Balmuth & Tykot 1998, "The Mycenaeans in Sardinia", p. 400; Runnels & Murray 2001, p. 15. ^ Ridgway 1992, p. 4; Taylour 1958; Fisher 1998; Runnels & Murray 2001, p. 15; Vianello 2005, "Eastern Sicily and the Aeolian Islands", p. 51; Feuer 2004, pp. 155–157; van Wijngaarden 2002, Part IV: The Central Mediterranean, pp. 203-260. ^ de la Cruz 1988, pp. 77–92; Ridgway 1992, p. 3; Runnels & Murray 2001, p. 15. ^ "Amber object bearing Linear B symbols" (in German). Freising. 1999. Archived from the original on August 30, 2016. Retrieved February 9, 2018. ^ Budin 2009, p. 53: "One of the most extraordinary examples of the extent of Mycenaean influence was the Pelynt Dagger, a fragment of a Late Helladic III sword, which has come to light in the tomb of a Wessex chieftain in southern England!" ^ Feuer 2004, p. 259. ^ a b Kelder 2010, p. 115. ^ Castleden 2005, p. 146. ^ Castleden 2005, p. 157. ^ Kelder 2010, p. 114. ^ Castleden 2005, p. 144. ^ Castleden 2005, p. 160. ^ Paul, Adams John (10 January 2010). "Mycenaean Divinities". Northridge, CA: California State University. Retrieved 25 September 2013. ^ a b c Castleden 2005, p. 143. ^ Nilsson 1967, Volume I, pp. 500–504; Chadwick 1976, p. 88: "Pa-ja-wo suggested Homeric Paieon, which earlier would have been Paiawon, later Paidn, an alternative name of Apollo, if not again a separate god." ^ Chadwick 1976, pp. 95, 99. ^ Nilsson 1967, Volume I, pp. 565–568. ^ Chadwick 1976, p. 99. ^ Chadwick & Baumbach 1963, p. 176f. ^ Kn V 52 (text 208 in Ventris and Chadwick); Chadwick 1976, p. 88. ^ a b Mylonas 1966, p. 159. ^ Chadwick 1976, pp. 92–93. ^ Mylonas 1966, p. 159: "Wa-na-ssoi, wa-na-ka-te, (to the two queens and the king). Wanax is best suited to Poseidon, the special divinity of Pylos. The identity of the two divinities addressed as wanassoi, is uncertain." ^ Chadwick 1976, p. 76. ^ Ταράντου, Σοφία (28 April 2009). "Βρήκαν μυκηναϊκό ανάκτορο". Ethnos.gr. Retrieved 25 September 2013. ^ Fields 2004, p. 20. ^ a b c d Fields 2004, p. 10. ^ Schofield 2006, p. 78. ^ a b c Fields 2004, p. 11. ^ Tandy 2001, p. 20: "In LH IBBB (ca. 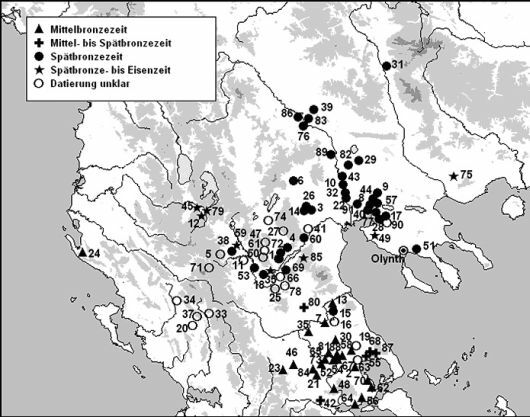 1310-1190), Mycenaean material culture spread widely throughout coastal and inland Epirus; in this period Mycenaean engagement in Epirus was strongest, both quantitatively and qualitatively. Though the Kiperi tholos may have gone out of use early in LH IIIB, the Cyclopean wall found there, as well as those at Ephyra, Kastriza, and Ayia Eleni, cannot have been built (and probably after) LH IIIB." ^ Iacovou 2013, p. 610. Iacovou quotes Vassos Karageorghis who states that "The introduction of 'Cyclopean'-type walls at the very beginning of the LC IIIA period at Enkomi, Kition, Sinda and Maa-Palaeokastron was due to the arrival of Mycenaean settlers in Cyprus." ^ Kelder 2010, p. 127. ^ Fields 2004, p. 44. ^ Wikander 1990, p. 288; Shear 2000, p. 134. ^ Cline 2012, p. 305. ^ a b c Cline 2012, p. 313. ^ Palaima 1999, pp. 367–368. ^ D'Amato & Salimbeti 2011, p. 10. ^ Howard 2011, p. 7. ^ a b Howard 2011, p. 50. ^ Schofield 2006, p. 306; D'Amato & Salimbeti 2011, p. 13. ^ Howard 2011, p. 63. ^ Fields 2004, p. 22. ^ Schofield 2006, p. 119. ^ D'Amato & Salimbeti 2011, p. 23. ^ D'Amato & Salimbeti 2011, p. 27. ^ Kagan & Viggiano 2013, p. 36: "In fact, most of the essential items of the "hoplite panoply" were known to Mycenaean Greece, including the metallic helmet and the single thrusting spear." ^ D'Amato & Salimbeti 2011, p. 20. ^ Cline 2012, p. 312; Schofield 2006, p. 123. ^ a b c d Castleden 2005, p. 135. ^ Castleden 2005, pp. 135–137: "Large kraters decorated in Pictorial Style are found almost exclusively in Cyprus, and for a long time it was naturally assumed that they were manufactured there, but a few examples have been found on the Greek mainland, mostly near Mycenae, and it has now been established that they were all manufactured at workshops close to Mycenae, probably at Berbati just to the east of the city, where there are the right clay sources. The ware was probably specifically made for export to Cyprus, where they were used as centerpieces for drinking ceremonies. The decoration appears to have been painted on at high speed and the effect is sometimes crude; Reynold Higgins calls it 'barbarous', which is a fair description, but the scenes showing warriors, horses and chariots can still tell us much about everyday life in Mycenaean Greece, and as much again about Mycenaean religious beliefs and mythology. One krater from Enkomi in Cyprus shows a charioteer with his groom riding along, perhaps into battle, while a long-robed god, Zeus perhaps, stands in his way holding the scales of destiny that will decide his fate. It is an archetypal scene reminiscent of several in the Iliad, where the gods are shown intervening in battle and deciding the outcome." ^ Furumark 1941, p. 78: "There are two types of Mycenaean lamps. One of these (type 321) has a broad horizontal lip with two opposite depressions for wicks. This type is the clay version of a Minoan stone lamp, known in many examples both from Crete and from the Mainland. The other (type 321 a) has one wick-spout and a handle at the opposite side." ^ Castleden 2005, pp. 56, 166. ^ Schofield 2006, p. 107. ^ French 1971, pp. 101–187. ^ See account of their use in K.A. and Diana Wardle "The Child's Cache at Assiros, Macedonia", in Sally Crawford and Gillian Shepherd (eds): Children, Childhood and Society: Institute for Archaeology and Antiquity Interdisciplinary Studies (Volume I) Oxford: Archaeopress, 2007. ^ Taylour 1969, pp. 91–97; Taylour 1970, pp. 270–280. ^ Cavanagh & Mee 1998. ^ Taylour, French & Wardle 2007; Alden 2000. ^ Hammond 1967, p. 90. ^ Dickinson 1977, pp. 33–34, 53, 59–60. ^ Dickinson 1977, pp. 53, 107; Anthony 2007, p. 48. ^ Castleden 2005, p. 97. ^ Kelder 2010, p. 95. ^ Graziado 1991, pp. 403–440. ^ a b c "Linear A and Linear B". Encyclopædia Britannica. Encyclopædia Britannica, Inc. Retrieved 3 March 2016. ^ "Sir Arthur Evans". Encyclopædia Britannica. Encyclopædia Britannica, Inc. Retrieved 3 March 2016. ^ "Michael Ventris". Encyclopædia Britannica. Encyclopædia Britannica, Inc. Retrieved 3 March 2016. ^ a b c Castleden 2005, p. 2. ^ Hansen 2004, p. 7. ^ Sansone 2004, "Greece in the Bronze Age", pp. 7–8. ^ Castleden 2005, p. 235. ^ Castleden 2005, p. 228. ^ Vallance, Richard (2015). "Did you Know you Speak Mycenaean Greek? You do!". academia.edu. Retrieved 30 March 2016. Whether we realize it or not, not only are tens of thousands of English words direct derivatives of ancient Greek, but some are derived even from Mycenaean Greek, which makes them very ancient indeed! ^ Castleden 2005, p. 230. Alexakha, Andrey (2016). "A Model of Social Progress". The Journal of European Economic History. 3: 137–209. Castleden, Rodney (2005). The Mycenaeans. London and New York: Routledge. ISBN 978-0-415-36336-5. Chadwick, John; Baumbach, Lydia (1963). "The Mycenaean Greek Vocabulary". Glotta. 41 (3/4): 157–271. Chadwick, John (1976). The Mycenaean World. Cambridge, UK: Cambridge University Press. ISBN 978-0-521-29037-1. Dickinson, Oliver (December 1999). "Invasion, Migration and the Shaft Graves". Bulletin of the Institute of Classical Studies. 43 (1): 97–107. doi:10.1111/j.2041-5370.1999.tb00480.x. Graziado, Giampaolo (July 1991). "The Process of Social Stratification at Mycenae in the Shaft Grave Period: A Comparative Examination of the Evidence". American Journal of Archaeology. 95 (3): 403–440. Kelder, Jorrit M. (2010). The Kingdom of Mycenae: A Great Kingdom in the Late Bronze Age Aegean. www.academia.edu. Bethesda, MD: CDL Press. Retrieved 18 March 2015. Sansone, David (2004). Ancient Greek Civilization. Malden (Massachusetts), Oxford (United Kingdom), Carlton (Victoria, Australia): Blackwell Publishing Ltd. ISBN 978-0-631-23236-0. Tandy, David W. (2001). Prehistory and History: Ethnicity, Class and Political Economy. Montréal, Québec, Canada: Black Rose Books Limited. ISBN 978-1-55164-188-1. Wikander, Örjan (January–March 1990). "Archaic Roof Tiles the First Generations". Hesperia. 59 (1): 285–290. doi:10.2307/148143. JSTOR 148143. Anthony, David W. (2007). The Horse, the Wheel, and Language: How Bronze-Age Riders from the Eurasian Steppes Shaped the Modern World. Princeton, NJ: Princeton University Press. ISBN 978-0-691-05887-0. French, Elizabeth Bayard (2002). Mycenae: Agamemnon's Capital. Stroud: Tempus. ISBN 978-0-7524-1951-0. Güterbock, Hans G. (April 1983). 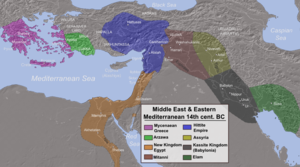 "The Hittites and the Aegean World: Part 1. The Ahhiyawa Problem Reconsidered". American Journal of Archaeology. 87 (2): 133–138. doi:10.2307/504928. JSTOR 504928. Mellink, Machteld J. (April 1983). "The Hittites and the Aegean World: Part 2. Archaeological Comments on Ahhiyawa-Achaians in Western Anatolia". American Journal of Archaeology. 87 (2): 138–141. doi:10.2307/504929. JSTOR 504929. Vermeule, Emily Townsend (March 1960). "The Fall of the Mycenaean Empire". Archaeology. 13 (1): 66–76. JSTOR 41663738.